Looking for an original party theme for your child’s next birthday ? Call in Crafty Jackdaw – the children’s party entertainers with a difference! When you have exhausted the play centre/swimming party/pass-the-parcel options, Crafty Jackdaw’s creative activities provide an inspiring party option. 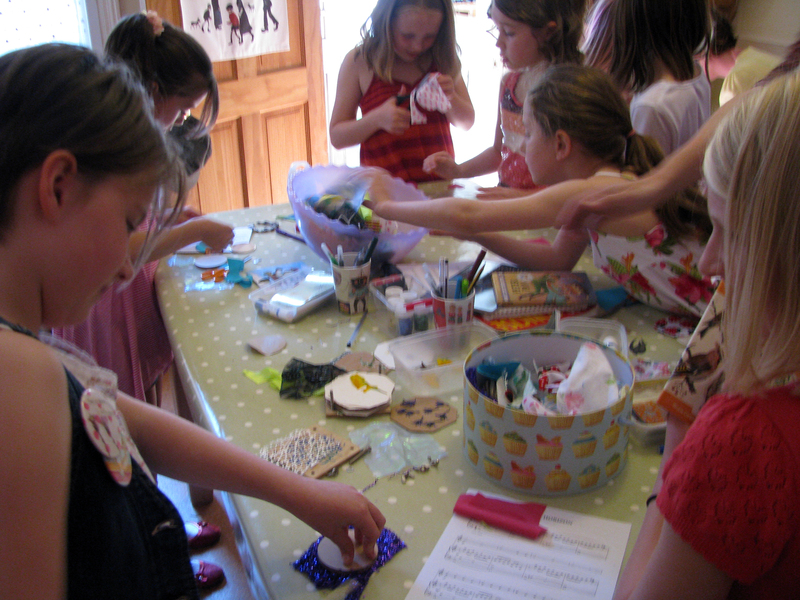 Crafty Jackdaw is an independent business providing arty parties for girls and boys in Sheffield. Whether you are having a party at home or another venue, we will bring our treasure trove of carefully sourced, quality and quirky materials to you. We provide an hour’s activity during which we support your child and their friends to make fabulous things to keep. Crafty Jackdaw is all about enthusing and enabling kids to have creative fun. What nicer way to celebrate you child’s next birthday than watching them getting creative with a group of friends, while you sit back, relax and enjoy the party! Crafty Jackdaw is well known for our first activity badge making. Using our fantastic badge machine and our cool and funky materials to make their own collection of badges, we guarantee your little jackdaws will love this activity. We are proud to announce our BRAND NEW mosaic making activity. Using beautiful glass and ceramic tiles, as well as a fabulous range of querky materials (old costume jewellery, nuts and bolts, buttons and beads), children can create their own mosaic designs. Crafty Jackdaw is not ju st for kids – we know grown-ups enjoying getting creative too! Have a look around our website, leave a comment and contact us if you want to hear more.